Pre-race tactics were to keep over to the Island side for the first beat to Craft Insurance from the start at Hill Head and had to persevere to get into the right position as most of the fleet were trying to start at the pin end of the line. Once in clear air made good progress and with light winds we dropped Growling Cougar and a bit of tacking on the shifts later on got us ahead of a few of the higher raters. Kite up away from the first mark and onto Daks followed by a gybe back to Hill Head. Wind was quite variable on the beat back to Craft Insurance and it also started to rain. Kite back up for second run down to Daks and race committee came on the radio and announced that the race was to be shortened at Norris. 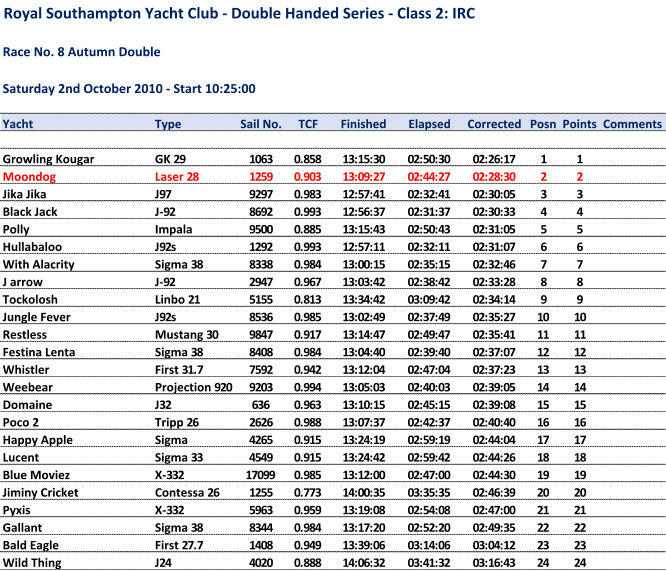 Decent lead on few on of the lower rating boats but as we found out later not enough time on Growling Cougar who got first but well pleased with a second which cemented our overall series win.